The Insulator Greenhouse is a Gutter Connected structure to be covered with poly. Available in Code or Non-Code versions. This house provides quality, strength and ease of construction. 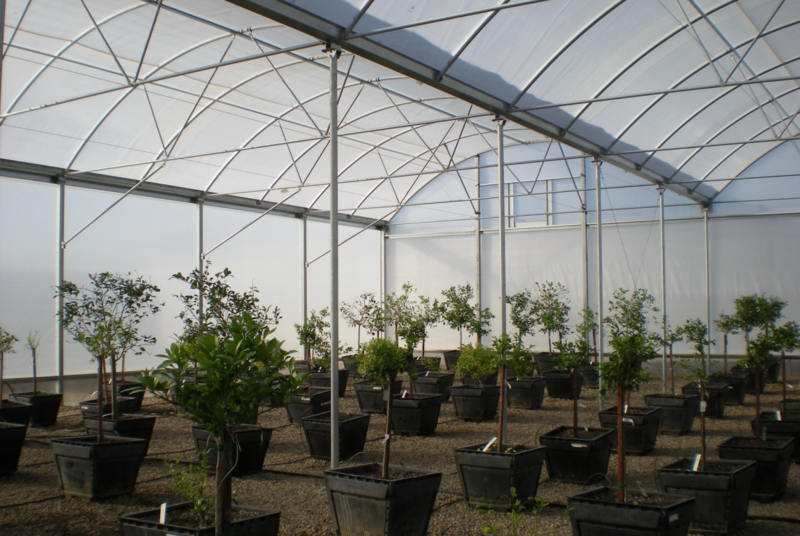 The Insulator Greenhouse performs well in all climates from Alaska to Mexico and beyond. Gutter Connected Widths of 18', 21', 24', 27', 30', & 35'. All Galvanized Steel bolt-together frame. All Arches are 6' on-center. Six foot arch spacing is the optimum for poly roof to prevent rain and wind pockets. Heavy Duty Commercial grade Gutters of (10 and 12 gauge) at side and mid columns. The gutters are 11" wide and 6" deep. 3 runs of condensate purlins are standard on all Insulator houses to be covered with poly. Condensate gathering purlins are a strong "Z" design and protect plants from condensate drip. 4" square sidewall columns 12' on center are standard. 4"sq or 2 7/8" interior columns 12' on center are standard. Wide spans and heavy loads may use 6' on center interior columns. International Building Code of 12/100C is standard. Snow loads and increased wind exposures are also available on some widths. Call for availability. All these houses are available as a Non Code version, the Insulator-NC.